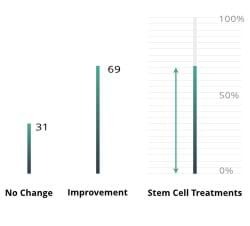 How effective Adult Stem Cells are in Curing Diseases? Adult stem cells have the potential to replenish person’s trillions of specialised cells from just a few unspecialised cells. These adult stem cells are like stem cell repository used by the body for the normal wear and tear. Since recent decade nearly everyone from the medical and scientific community is looking towards the stem cells as prospective frontiers for treating people for a myriad of diseases. The main idea behind exploiting stem cells for the treatment is to control and guide the growth of the adult stem cells in the laboratory and then use these to replace dysfunctional cells that are present in the disease. However, there are certain limitations to this approach. Whether the therapy will work in your case or not, or if it does work, it will work till what extend, is something we can not predict accurately but what we do know that thousands of patients across the world have opted for this therapy and a large majority have benefited from it. The only assurance we can provide is that it is not going to have any negative impact on your disease or symptoms whatever. There are additional issues as well, like adult stem cells are found in miniscule quantities and this can pose difficulty for identifying and isolating them in large number for therapeutic application. Even when cells are isolated and grown, the new cell require proper residence at the site of injury and they must then essentially learn how to effectively function alongside person’s own tissue. For instance if you can imagine a cardiac stem cells being implanted think about the fact that it may not beat with the same rhythm of a person’s heart cells and is thus ineffective. These challenges have motivated Advancells to work harder and help people enjoy a better life. We believe in improving the quality of life of the patients who come to us for medical aid. Patients are provided with the stem cells generated from their own body and this treatment has been making wonders when the classical methods of medication fail to work. After evaluating the patient’s medical history, our in-house experts suggest whether a stem cell treatment would be applicable for a particular case or not. If applicable, they also decide the mode of treatment to be provided. The treatment evaluation is free of cost for our patients. Post-extraction, the quality of the patient’s stem cells is measured on the basis of cell viability and the strength of the extract. The quality and nature of the source used is of utmost importance to get the better outcome. Therefore it is always advisable to the people who have opted for stem cells treatment to ask for certificate wherein the details of number of stem cells injected into their body and cell viability is mentioned. Please also do make sure that your stem cells are being processed in cGMP certified laboratory to avoid issues of contamination.